Who is Mangia Bene Mama? Lisa on For the Locals – A New Ristorante Delizioso! Marty on For the Locals – A New Ristorante Delizioso! 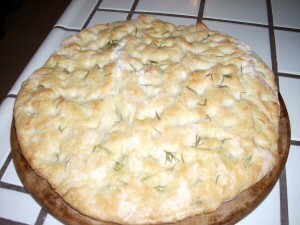 If you want an aromatic and tasty focaccia you don’t have to leave your house because you can whip this up in no time! Seriously. No machine needed. This takes about 10 minutes of prep time, 1 1/2 hours of rising time and 20 minutes of baking time – that’s it! Dissolve yeast and sugar in 1/2 cup warm water and let sit for 5 minutes until bubbly. In a large bowl, combine flour, salt and 3 tbsps of the rosemary. Add yeast mixture and remaining water. Mix thoroughly with a wooden spoon and/or your hands. Transfer to a floured cutting board and knead by hand for a few minutes until smooth. Once risen, punch down and place on an oiled baking sheet (I use my round pizza stone, but a cookie sheet is fine). Press dough down with your hands into a circle, dimpling it with your fingertips. 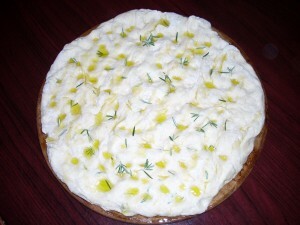 Drizzle with the olive oil and sprinkle with coarse sea salt and remaining rosemary. Bake for 20-25 minutes, until golden. Serve warm or at room temperature. Note: The thinner you pat down the dough, the crisper the foccacia. The thicker you leave it, the softer the bread. Thick is great for making sandwiches. Vatiations: Use sage instead of rosemary. Add sliced olives, red onions, or zucchini. Cheeses of most any kind are terrific on it – parmesan, mozzarella, fontina, etc. Get Your FREE Recipe of the Week! This site is dedicated to my mom, Patricia Heim.